Want all the details on our high-quality just sold postcards? Other Options: Product customization is available. You may use our templates to design your own postcards for free. For $25 we will customize your postcard for you utilizing one of our templates. If you want a custom postcard designed from scratch, we can do that for you for $50. The customer must provide individual photos, logos and other branded graphics. All Images should be of print quality. Product customization include changing your layout, adding designations, and silhouetting your photograph. BestPrintBuy.com’s just sold postcards are custom designed real estate marketing tools to demonstrate your success, and help you acquire new customers. Sending out just sold postcards is an inexpensive way to easily market your services to new clients. In this economy, a potential listing client will want to select a real estate agent with a proven track record for selling homes. Just sold postcards deliver your track record to their door, keeps your name in front of them and makes them aware that listing with you is a winning proposition for them. Creating your just sold postcards is a snap with our online design studio and we are happy to design them for you for a low fee, if you prefer. 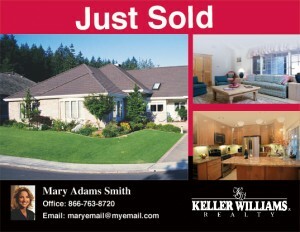 Just sold postcard campaigns extend your marketing reach. Smart agents celebrate their success, you can announce your own with our economical just sold postcards for pennies apiece. It’s not bragging (although there is a touch of that!) and will position you as an agent that can sell houses in the areas you want to target to secure more real estate listings. Can there be a better introduction to potential new clients than all your contact information attached to proof of your ability to sell houses? Send them to previous clients too. It will keep you in the forefront of their memory when they need your services again and will encourage them to recommend you to family and friends. To grab more attention, consider phrases like, “This Home Just Sold! Want Yours To Be Next?” or “Sold! In Only 10 days!” or “Ever Heard of Staging? It’s Another Word for Sold!” BestPrintBuy.com offers a wide variety of templates to create attention-grabbing headlines for your Just Sold postcards. Put your latest sale in context of the current market. “Sold! In Only 10 days” might have a secondary line like, “I can show you how to sell your house quickly, at the right price, even in the current economy, like I did for these clients.” Use the flip side of the just sold postcard to offer additional information and a link to your website for expanded information on the topic of successfully selling houses now. Our just sold postcards are designed to get people talking about you, about local real estate, and about how to get properties sold… using you! Send just sold postcards out within a week of closing. BestPrintBuy.com offers two real estate postcard sizes (traditional and jumbo), over 50 categories of postcards, and over 2000 templates to make designing a snap. Our postcards are printed on 130-pound, 16 pt card stock with a high-quality, color enhancing UV coating. We don’t permit inferior quality components for our clients, because it’s our job to help you put your best foot forward. Create your just sold postcards now on BestPrintBuy.com. If you have any questions, call us at 1-866-763-8720. We are here to help! This entry was posted in Product Showcase and tagged branding, farming postcards, interactive print marketing, listed properties, marketing materials, postcard mailing, postcards, print marketing, promotional products, real estate marketing, real estate marketing strategies by admin. Bookmark the permalink.